SpaceX is no stranger to making commercial spaceflight history. They were the first private corporation to launch a liquid-fueled rocket into orbit, send a re-supply spacecraft to the International Space Station, and to land their first-stage rockets back on Earth (for potential re-use), among other milestones. They’re also on the cusp of providing transportation services for International Space Station crew members. On February 19, 2017, SpaceX accomplished another major feat: They became the first private company to launch from the historic Launch Pad 39A at Kennedy Space Center. SpaceX became the first commercial corporation to lease space and operate out of Kennedy Space Center when, in 2014, they signed a 20-year lease for the historic Launch Pad 39A. It was from this launch pad that Apollo 11 blasted off for the Moon, when Neil Armstrong and Buzz Aldrin became the first humans to step foot on our lunar neighbor. It also hosted the first Space Shuttle mission, as well as some 90 others. Now, and for at least the next two decades, it’s in the hands of SpaceX, further cementing the foothold that the private sector has made in the space program. 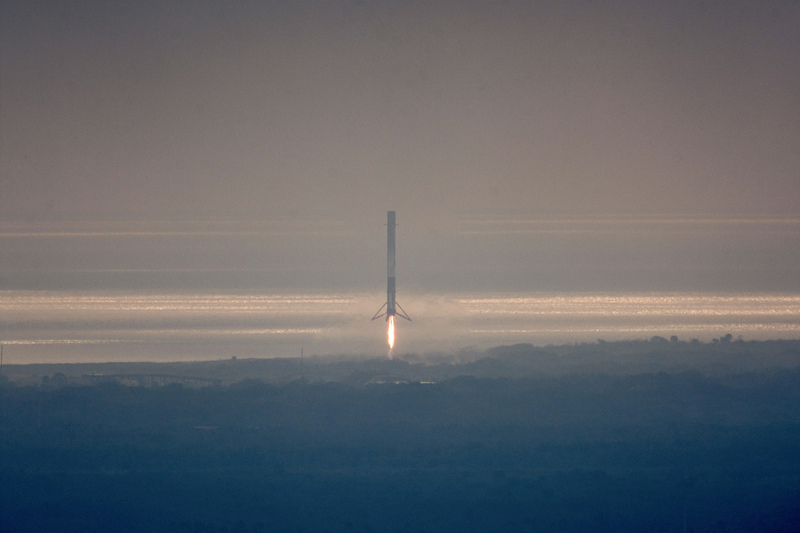 At 9:39am EST, on February 19, SpaceX’s Falcon 9 rocket ignited and thundered into the clouds. The rocket was topped with the Dragon capsule, carrying more than 5,000 pounds (2,267 kg) worth of cargo destined for the International Space Station. Dragon arrived and successfully docked with the ISS a couple of days following launch. But that wasn’t the only show in store for the lucky spectators in Florida that day. After shoving Dragon into orbit, the Falcon first stage began its 100-kilometer return trip back to Earth. In fewer than 10 minutes following lift-off, the first stage rocket re-emerged through the clouds and landed at Landing Zone 1, just a few miles away from the launch pad. Thaller described the period of suspense in between the launch and the Falcon landing, and said that in some ways there was more anticipation for the landing than there was for the launch. [N]othing quite prepares you for what happens 7 minutes later, just as the adrenaline is wearing off. Silently, at first, this 230-foot first stage turns around and comes down out of the sky. Smoothly, surreally, a tower the size of a 15 story building just comes and sets itself down. Only once it’s down do you hear the double pop of a sonic boom. It sort of turns your stomach. Things that big are not supposed to just come out of the sky and land. It’s awesome. I’ve often been jealous about being born too late to experience the race to the Moon. I’ve been somewhat depressed since watching the last Shuttle mission touch down in 2011. But when I take a step back and look at what is occurring today and what we have to look forward to, I can’t help but recognize what a wonderful time it is to be alive. You can watch the full webcast of the launch on SpaceX’s YouTube channel. Tagged Dragon, historic, International Space Station, launch, Launch Pad 39A, Michelle Thaller, NASA, SpaceX.